Floating on to ___ grade!! End of the year project! I found these great videos to show the students before they get started! Bubbles from baris parildar on Vimeo. First we talked about the properties of bubbles. I blew some bubbles for the kids to look at (with their hands in their laps...pure torture) but I really wanted them to use their eyes. What shape is the shiney? Where is the light source? For example a window will make a window shaped shiney! What color are the bubbles and why do they start as a clear liquid and then turn rainbowy? 1 First students traced as many different circle shaped objects I could fine!! Then, one student suggested that they put their papers together and connect their bubbles. Within a few minutes, I had an entire class on the floor connecting EVERY one of their papers to make a huge bubble mural! They were SO excited and I loved the conversations I heard as they ALL worked together as one giant group!! The end product was a masterpiece and the kids were SO excited!! Some classes drew bubbles together to form words. You can see the words " Pie is Good" at the top of this class' Art! The great thing about this project is that its fun for ALL ages! 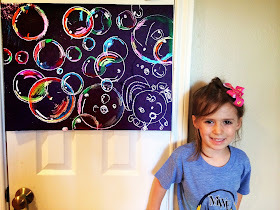 My four year old (below) drew her own bubble artwork (all by herself) and included herself blowing the bubbles in the bottom corner! She had fun searching for circles in the kitchen. There are Tabasco bottle circles, and salt shaker circles, coffee can lid circles, a soda can circle! 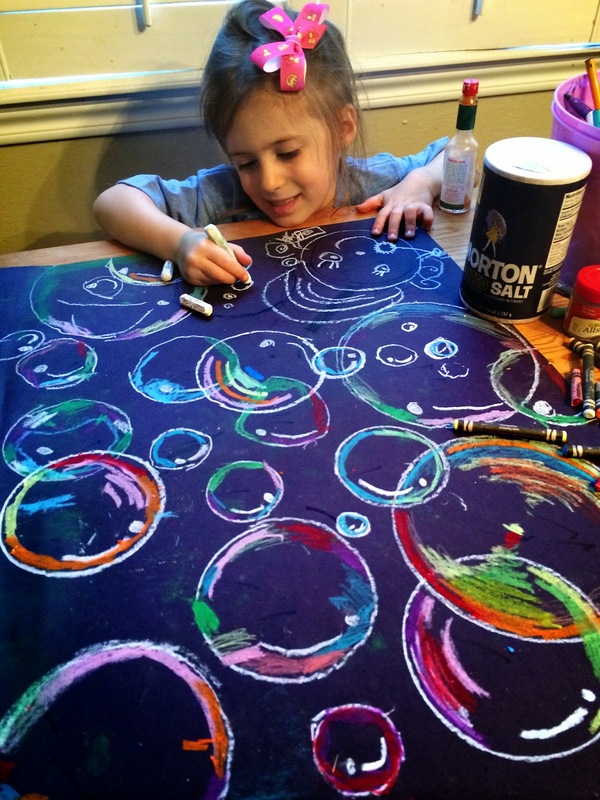 So get out your oil pastels and go create some Bubble ART to kick off the SUMMER!!!! 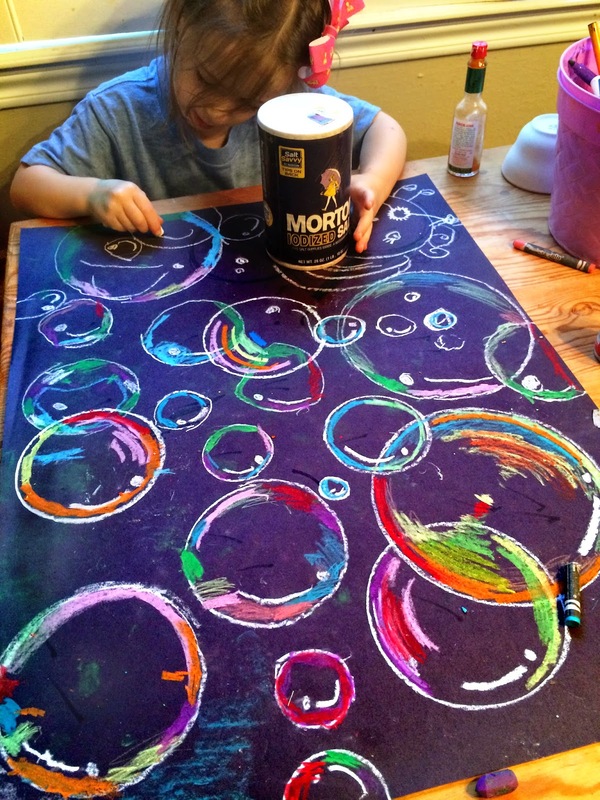 The great thing about bubbles is that they are inexpensive and fun no matter what age you are! My daughter got a bubble blower last summer that blew small bubbles inside large bubbles! We took this picture last August! What a fun simple project for the end of the year! You always have the best ideas I can't wait to try some of these out for my 3 week summer school class (where I will actually see the kids everyday!) especially the surreal self portraits! Thanks for sharing. Awesome!!!! Love this project. Perfect for end of year. Thanks for adding those videos - just need to buy a bottle of bubble solution. I love the colors in the bubbles! What brand of oil pastels did you use? Great project!! Estoy muy de acuerdo con sus puntos de vista sobre su blog. Love the vibrant colours. What brand did you use? I wanted to thank you for posting those wonderful videos, saved me time and they are perfect! Hi! I love these and just tried them out with my second graders! Would you mind if I posted this lesson to my classroom blog? Of course, I will give you credit for the wonderful idea. I just really want to share the photos with the parents. Such a cool collaborative piece! I love this! I'm thinking of doing it at the beginning of the year for International Dot Day. I really like the way the class put them all together. It must have been a very special group of kids to think of it on their own. I'm impressed at how they didn't smear the pastel colors and wonder if they were instructed to be careful of that. This is beautiful--thanks for sharing! Well post and i see pic and read this article and its give us great source of information how to make bubble drawing many student together and how to complete project thanks for sharing app marketing services . This makes me want to cry! What an amazing and exciting discovery those kiddos made... That will stay with them their whole lives. So special and so inspiring. Yay! Thank you! I've tried several times and mine look awful. Is there some trick that I am missing? Brilliant and so inspiring! Thank you! I am following your blog. Definitely a project to be tried. 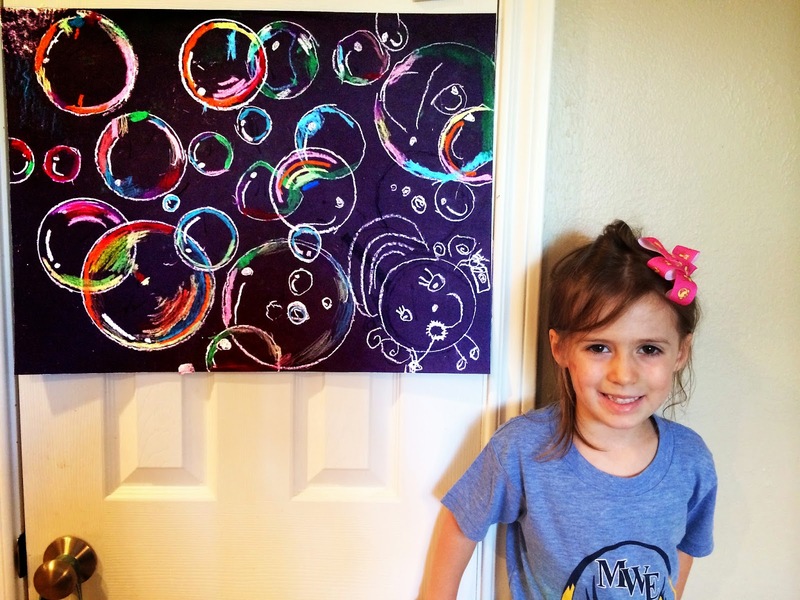 Do you have a specific bubble solution recipe to share? Will any wire ring make bubbles, for example, a wire coat hanger bent into a shape? What a fun project! The colors are so vibrant! What brand of oil pastels do you use? Hello from Canada.HERE IS THE BEST BUBBLE RECIPE FROM THE ONTARIO SCIENCE CENTRE. you have any trouble for installing or configurig netgear extender click on the link above. Thanks to setup Netgear range extender with our wifi router. It improves our network and for more info click on the link. The Best Buy 2018 Black Friday Sale has arrived with great Black Friday deals on all kinds of electronics, including the latest tech and more. Awesome article for all the readers very nice content really i love the matter Happy New Year 2019 for upcoming New Year celebrations,very nice thoughts,Thanks a lot. Awesome article for all the readers very nice content really i love the matter. We provide comprehensive cleaning service in Sydney. Our cleaning service is the envy of other cleaning services. When considering which bond cleaning service to use, we recommend you give some thought to how Sydney Cleaners can assist you. Thanks for the space That let us introduce the game to your blog Thanks again. nice article. i like your post and all you share with us is uptodate and quite informative, i would like to bookmark the page so i can come here again to read you, as you have done a wonderful job. I found your blog using msn. This is an extremely well written article as . I will be sure to bookmark it and return to read more of your useful information. Thanks for the post. I’ll certainly comeback. office setup - Learn the most straightforward way to download and install the Office Setup 2019 to the device. Also, ensure its successful activation using the valid subscription of the Office Product Key by visiting https://office-product-2019.com/. norton setup - You might have been looking for a proper guide that helps you in downloading, installing and activating the Norton Product key. Visit norton.com/setup and proceed for the Norton installation setup. visit mcafee.com/activate to protect your PC from virus, spyware, online threats, etc. Activate McAfee AntiVirus from mcafee activate, enter 25 digit product key. Download, install and activate McAfee by sollwing the easy steps. office setup - Enter the thing enter in the required field on this page and snap Continue. On the running with trade, there is as decision Show Now. Thank you so much for sharing such a superb information's with us. Another aspect that often poses problems for students with regards to checking UP 12th Commerce Result 2019 is the process of getting the results. We have also addressed this problem and developed a very simple process with which the students will be able to check their UP 12th Result 2019. The post is truly best for the upcoming information and I like this post. You may all like this post for all the sports.